Many people wonder how to accurately determine the moisture in the soil and are looking for advice on how often to water. There is a great tool just for that purpose. It’s called a soil probe. Commercially referred to as a pipe probe, this tool is made by several companies. Structron makes one that is about 4 feet long and has a fiberglass rod with a metal bullet tip and rubber handles. There are no dials or gauges. This probe works by feel. 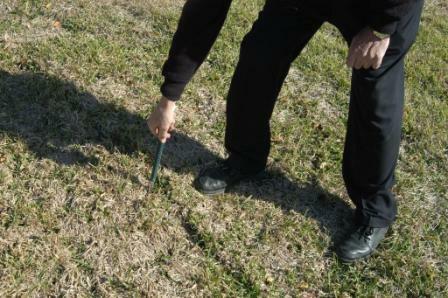 By pushing it into the soil, you can tell instantly whether the soil is too dry or too wet. Then the irrigation can be adjusted as needed. It also can be used to find pipes or underground obstructions such as rock and concrete. Girdling roots on trees can also be detected without digging. 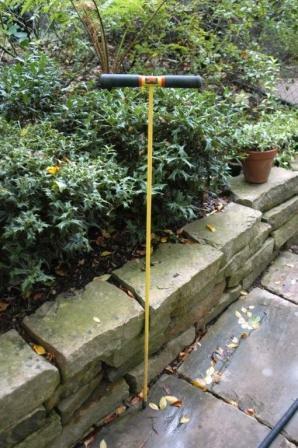 This is a great tool that all serious gardeners should own and use. These tools usually run in the $15 – 20 range. Using the probe is done by feel. If the soil is too dry, the probe won’t go in the ground easily. If the soil is too wet, the probe will sound like a cow pulling her foot out of the mud as it comes out of the ground. If just right, the probe moves easily through the soil. If the probe hits something hard, it could be rock, buried construction material, tree root or hardpan caused by poor management in the past. Digging is required to figure which of these is the culprit. Some can be removed. Hardpan is a compact layer of soil that must be physically penetrated and destroyed so that drainage works and tree roots can survive. For an even more affordable version of the moisture probe, break the head off an old or unwanted golf club. Making a clean sharp end by cutting with a hacksaw is best. What you should not do is make or use a probe that is all metal. 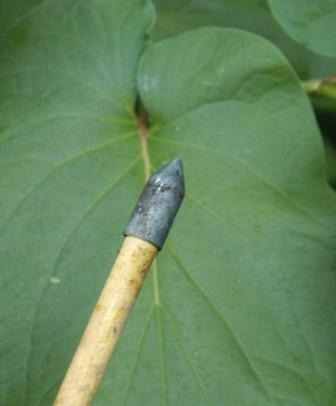 Using an all metal probe made of re-bar or other metal without a rubber handle is very dangerous. Electrical lines may be waiting for you!